Work has been resumed on SnapCterm. I seem to be getting into a flow with it which is good. Rolling through some less dramatic changes, iterating over sections and re-writing bits. Moving out bits to functions and general housekeeping that is hardly exciting reading. I gave in to actually processing the ESC codes and implementing what might be a state machine? Point of technicality, basically we start flagging and filtering through IFs as each character passes from RX buffer to screen. That said I haven't fully detached the RX Buffer from the screen, poping data from the buffer still gets posted to ANSI screen driver. Only now there is a process to watch the stream. So we can push other ESC codes to the screen to correct or respond to the remote system (which wasn't implemented in the ANSI driver!). Not quite at a point of calling this section of code done, I may go for a full disconnect, process the ESC code and modify before posting to screen. Took a while to figure out a process to handle this problem. Comes down to fully decoding the ESC code for setting colour and attributes. Keeping track of them in a set of variables. When we have a Bold enabled check the foreground colour against the background. If they match look up the colour code and push in an ESC code to change the colours. On the next ESC code that changes the colours, recall what the setting should be and replay them. Then because I pass characters direct to the ANSI driver, we then need to replay the last code sequence again! As the first processing updated the changed set, which might not have replaced all colours and attribute. This is one reason why I might need to re-think the design. 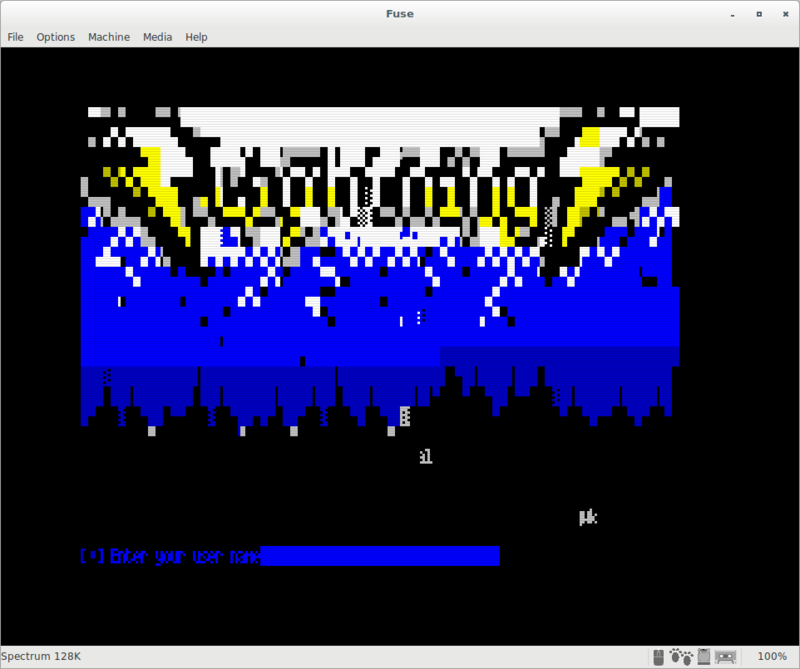 Any way picture time... Spot the original ANSI render using Mate Terminal in Linux. SnapCterm without correction and with correction on the Spectrum. So life got a little busy. This month I have resigned from my job and accepted an offer for a studentship (PhD). Yes its caused some paperwork and kicked the day job up into high gear. On top of the usual children's birthdays and find a school for the first born. So general short update. PLATOterm on the ZX is looking good and a few bugs removed. Thom is thinking about a large overhaul. I have started looking at buffering the RX data, which after some testing does seem to improve performance. The size of the buffer and time to fill needs to fit with the screen timings. Generally leads me to think there is a need to time to code more efficiently to the screen. There could be some performance gains from the screen draw routines, I have yet to venture into that code. 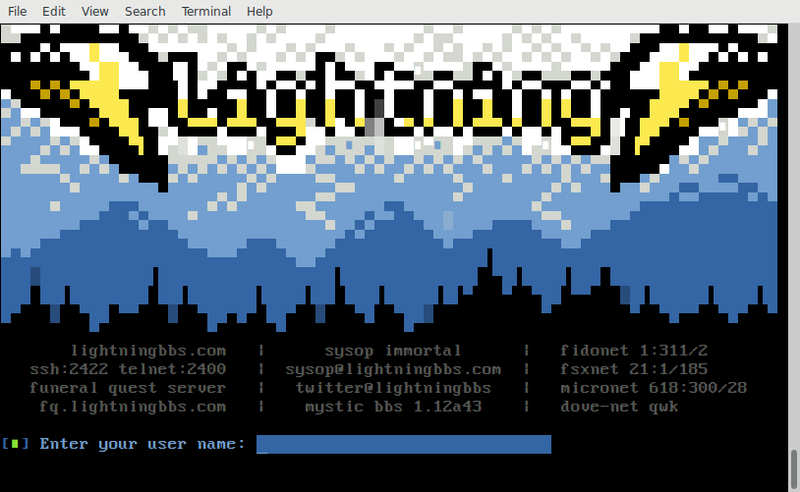 I opened up a small project called snapCterm, which is a ANSI 80 column terminal using the ANSI driver in z88dk. The initial testing of connecting to a BBS is working. There was a need to create the extended font set and then work out how to implement the extended fonts in z88dk. There is an interesting bug or not quite correct implementation of screen scrolling in ANSI drivers. ROM scroll is being used I think, which applies default attributes (black on white) to the new line. Problem with this is all BBS systems assume white on black, so you get nasty white lines feeding from the bottom on scroll. I managed to fix the scrolling line attributes, only to then find if a carriage return/line feed scrolls the screen. Again using the ROM code. So the dirty attribute bash I did using Ivan's ASM routine to paint attributes needs extending! Life is changing, life is busy! Emailed Thom my code for safe keeping, he seems to have managed to get the code accepted in to Z88DK! Guess that means I infect every project that uses the serial port on IF1 from now on! 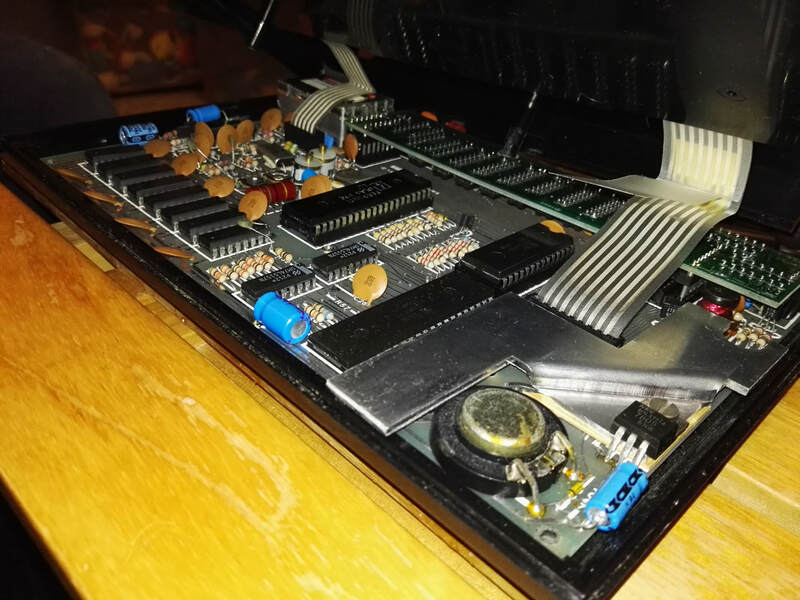 The Speccy kids should get the Jetset Willy comments, only regret is not sticking Make-A-Chip in there... Well there is always the clean up version I need to make. Fitted the membrane for the keyboard. Had a problem with the keyboard randomly going from working to totally dead. From what I can make out the tracks on the membrane shorted out on the shielding on the video output. A dash of insulation tape over the metal parts confirmed it. 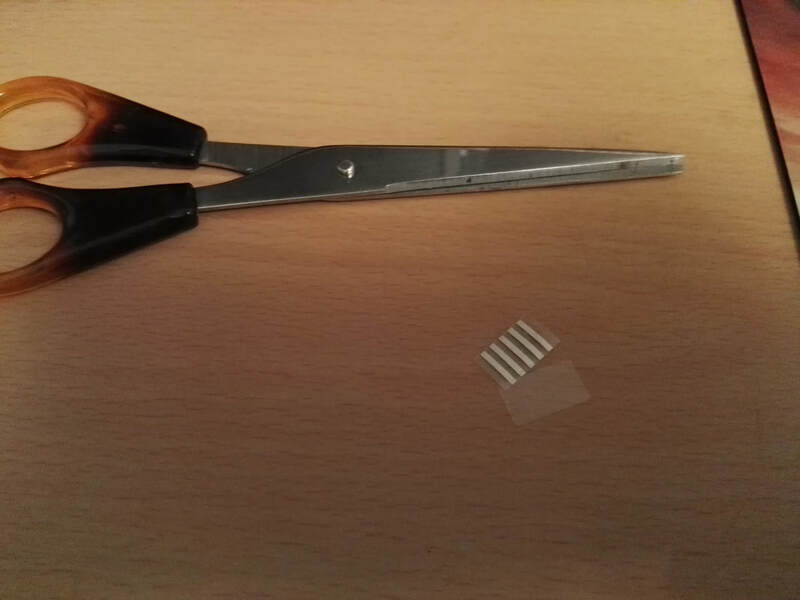 I moved the tape to the membrane to be sure it won't catch anything else. Both ribbons insulated and the case closed, can't help but wonder if that was the problem with the original. The old membrane is packed away safe, it might be working but I am not up for any faffing today. Still not feeling great. Interface 1 tested and working, did a little scrubbing on the edge connectors with white vinegar. Turned the queue tips from which to dull grey, so something has been removed. The IF1 seems to work, that is the basic interpreter works still on the spectrum. Usual childish 10 print "profanity" 20 go to 10 test program worked. Need to work on the RS232 cable pin outs. Hopefully better tomorrow and I can get the soldering iron out and get the leads made up. Then get on Irata.online, oh to be the first again would be nice. Issue 1 48K meets the PLATO over the internet. Feeling like crap today. What started as a throat infection kept me up with a cough, today is aches and pains. Found randomly dumped in the porch was a jiffy bag though with the IF1. I've had a quick look over and clean of the connectors this evening. It has been fixed in that Sinclair style, so hopefully it works. So turned out not to be the power lead from the PSU to spectrum. Having un-soldered one of the wires and testing continuity ever thing was fine. I reassembled the PSU tested it on the bench every thing was fine. Took it back in the house plugged it in setup, nothing worked. Tested the output, 1V again! After some muttering and wire wiggling nothing changed, until I knocked the PSU with my foot. 7V appeared on the meter, OK half the output very odd. Best bet was a dry joint. Out to the garage, re-soldered every thing. Tested and working now. Well the power supply is working. The next problem was the classic membrane failure on the keyboard. I might have been able to live with it, if it wasn't a fault on the row with J on it! 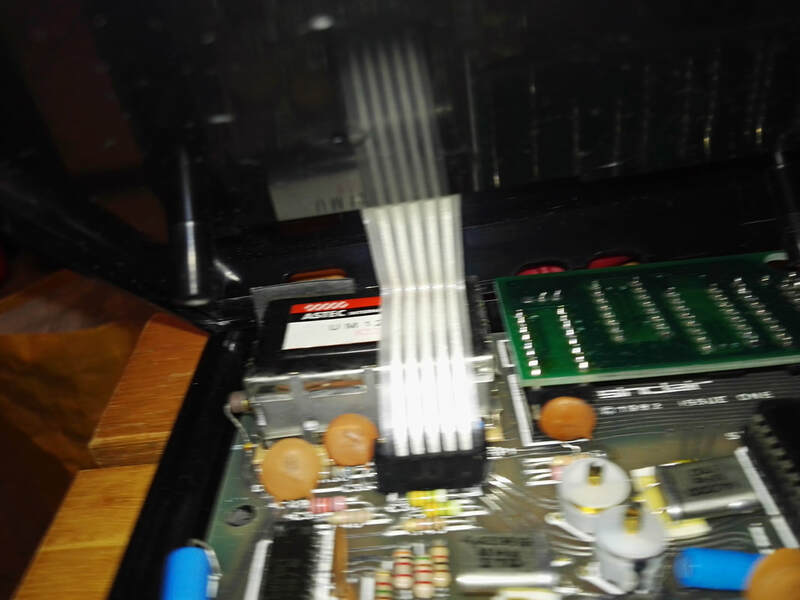 So opened it the speccy up again and had another look at the ribbons from the keyboard. Other than the discolouring there was a faint crack just above the connector on one side. It was worth a cheeky hack attempt, so I snipped it off just above the crack. Didnt work, actually made it damn near impossible to re-install. After several attempts I went from no keys to a few keys and back again. Seating the ribbon is a pain. I finished the evenings repair work with some washing up. Just waiting on the interface 1 to arrive and now the replacement membrane for the keyboard. ​Re-assemble and then hopefully get this old Issue 1 48K on the internet with an original IF1. The Irata.online project is bounding forwards its admirable the force being thrown in to porting the code across systems. I ran through code with Thom for a few hours looking for an illusive bug. 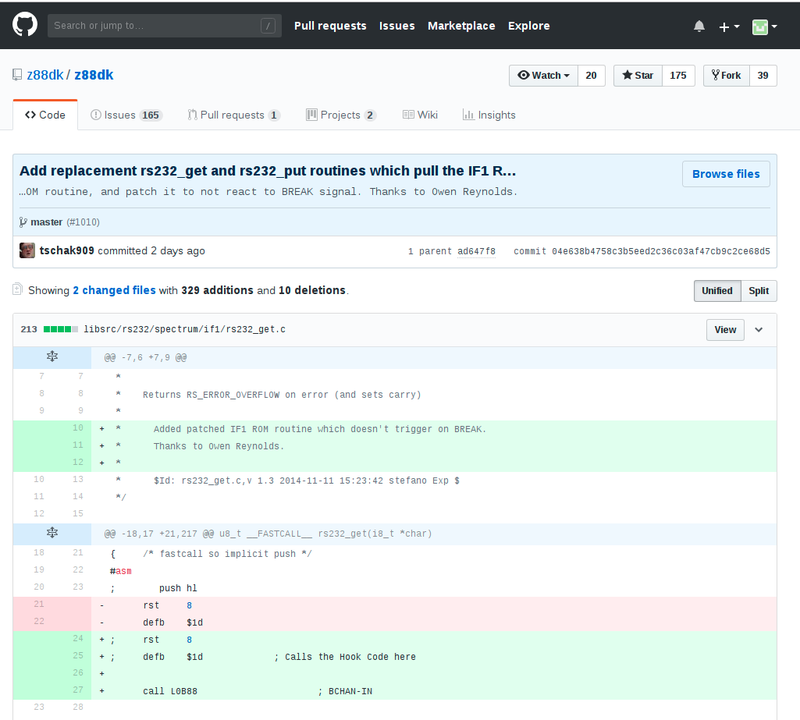 Issue with Talk and Bad passwords causing the cursor to mysteriously re position and over type causing no end of mess. I had a hunch about it being joined to the blank line process, damned if I could find my way through the code. Thom found it and the reference in the documentation to requiring a -15 being required to correct the position after clearing the line. Having only tested with the +3 I thought I should look at checking the Interface 1 RS232 code. There is a big assumption its just working. I had a scan through the assembly routines, there is very little in there probably calling ROM code (no comments can't tell!). 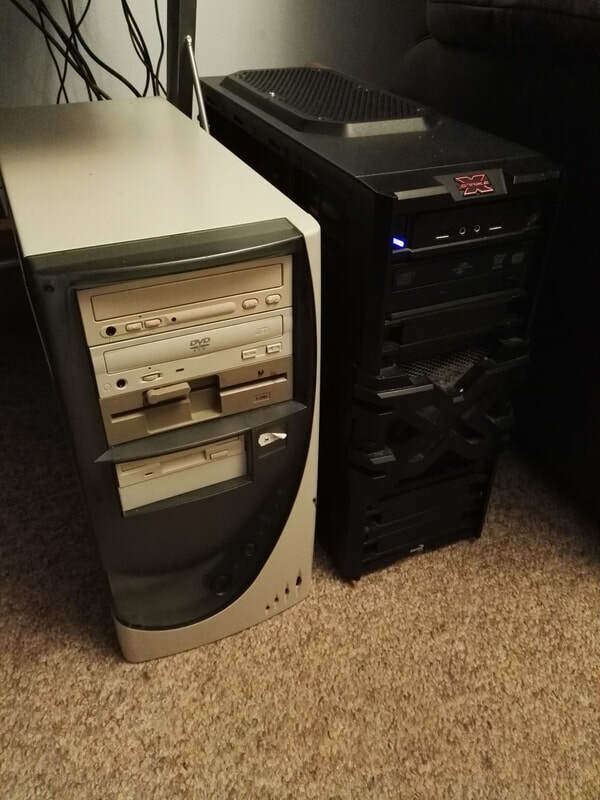 Step two, build a DOS PC. Yeah a DOS machine, P3 1Ghz no need to give up all the horses! So I had been planning to do this at some point as many of the old 8bit systems have DOS based PC tools. Just old code that works, no one is re-writing it and most modern OS'es wont let you gain low level access to the floppy drive anyway. 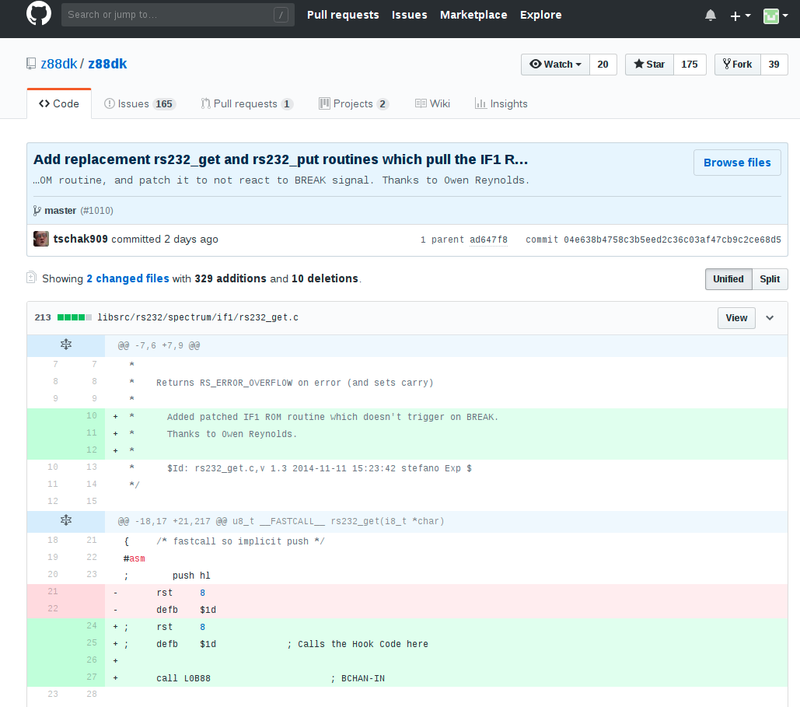 Sam Owen's git hub seems to indicate hes working on version 4 of his disk imaging software. We live in hope. So from DOS, launching RealSpectrum (Ramsoft). An old emulator which is actually very feature complete from what I can tell. It supports direct access to the disk drive too! So 3.5" disks can be written/formatted etc as native +3DOS. This will be useful in the future as a possible bridge to the +3. RealSpectrums IF1 serial code seemed to work. Damn keyboard locked out, so that ended the test. Is it the keyboard at fault or code? I know the IF1 is bit banged again, so may be the interupt issue is back but worse for what ever ROM code is in there? Next shot is Z80 from Gerton Lunter, I actually had a copy of this as shareware and is possibly the only shareware I upgraded to full version as a teenager. Serial port didnt work this time, but keyboard was fine. Given 3 emulators presented 3 different issues, I am giving up at this point. Fair to say a software defined port emulated and then using an actual buffered serial port is going to be a bust for testing. Even if it all worked, would it work on real kit? After some contemplation I did the next silly thing. Jumped on ebay and found an IF1 for £38 including postage. No microdrives, just the interface. Not sure I would want and actual microdrive they like to chew tape too much, far to impractical. VDrive on the other hand... Well may be for Christmas? Trip to Aladdin's cave at my parents and Dad has lent me his 48K. In exchange he will get an Interface1 for it as with out a machine its no use to me! Not +3 compatible you see. So Irata.online is going to get a full scale test with series 2 48K machine. This thing is about as old as me. So finger crossed I can boot this thing and not get a house fire going. Quick sanity check with the Spectrum group on Facebook. Peter Mulholland got it spot on with the cable being most likely at fault. Opening the PSU and testing at the board I found a nice 11V, slightly hot but with no load that is expected. Just need to cut the cable down and re-attach to the board. PSU actually looks to be in good condition. The casing looks to have warped a little, but I think that is from past problems. This old things had a repair or two over the years. Hopefully it will hold it together for the testing! 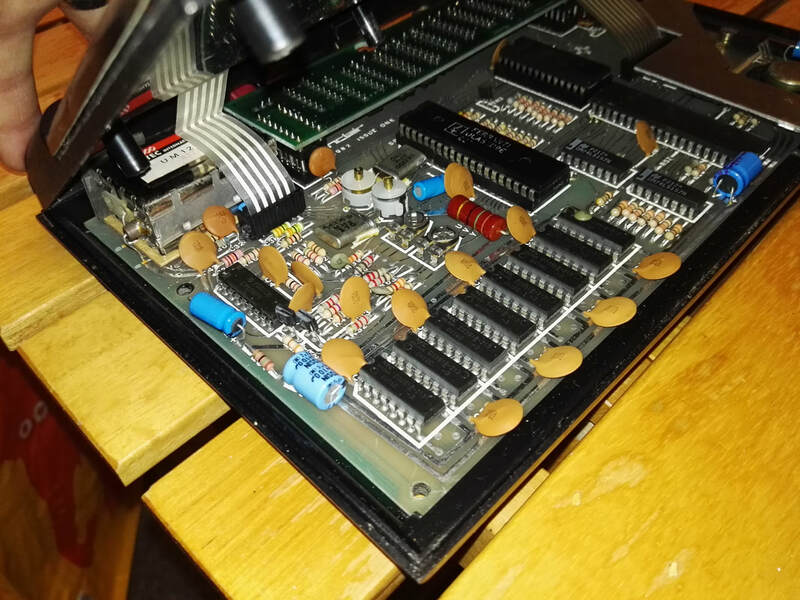 So with power under control next is a quick visual inspection on the old 48K. See if we have any leaking capacitors, bits of metal or other nasty surprises. 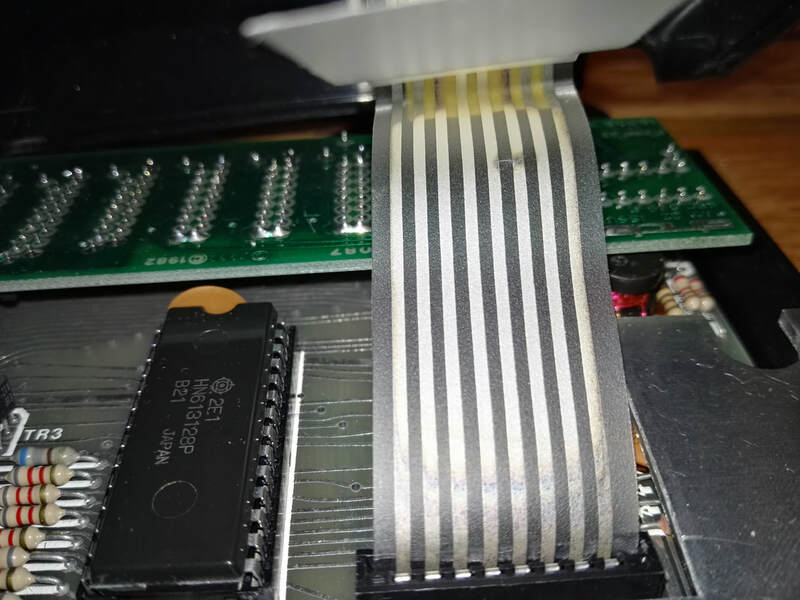 The keyboard membrane looks to be in good condition, the ribbon on the right seems suspect. If a row of keys isn't working on one side I know what it will be. All in all it is looking good in the case. Once the PSU is fixed up, I will just need to pray to the gods of silicon heaven. And pray the soul doesn't come out the back of the machine on power up. Worst case its off to a repair shop, "paging Dr Ian" the frequent call on Facebook group.